It has long been recognized that inbound links to your website have a very significant influence on your search engine placement. In fact, they are crucial; if you want to rank, you need to build links. Why does Google like inbound links? In a nutshell, if your site has links from other sites, Google and other search engines make the assumption that the quality and content of your site must be of high enough regard for others to promote it. And if some of your links come from highly respected authority sites, you will be doing even better. There are many methods for building high value backlinks — some more effective than others, some downright dodgy. However, here I give you 7 fantastically straightforward, legitimate ways to build quality links to your site. 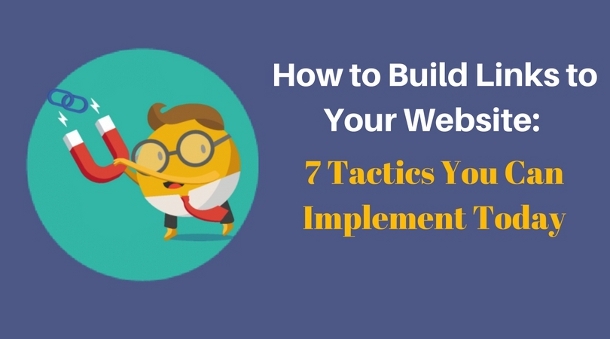 Best of all, you can easily start implementing these tactics today. No matter what the industry or the size of the company, businesses love to publish testimonials. Often, they are homepage material because everybody loves to show off when a good word is said about them and, since they also want to prove their testimonials come from real people, they will almost always happily provide a link back to you to verify. This means a fabulous link straight to you for very little effort. 1. Make a list of every product recently purchased or service recently used. 2. Check each of the sites of these services or products for the opportunity to provide a testimonial. 3. Submit or email a short written testimonial letting the site know you are happy for it to appear on their website. 4. Don’t forget to ask that they include a link to your site alongside it. 5. In the future, keep an eye out for relevant sites that include testimonials, and seriously consider buying their product so that you can submit a recommendation. This can be well worth the cash outlay for traffic growth! If you know how to look, you can find many occasions wherein your brand has been mentioned online but with no link. By simply asking for this mention to actually link to you, you can add some great links with very little effort. 1. Systemically use a tool like BuzzSumo or mention.net to find references to your brand and to get alerts of any new mentions. 2. For any mentions that are not currently linked to your site, check that this is a link that you would like to pursue. Reviews and product comparison blogs can be particularly lucrative for building authority links. 3. Make contact with the external site and thank them for the mention of your brand within their article, and then simply and politely ask them to consider providing a link back to you. If they have already written positively about your service or brand, they will probably be happy to help you out. This tactic is equally straightforward, although a little more time-consuming. The links you gain from this method are high quality from high value sites, however. Broken link building refers to the act of seeking out broken external links on websites, and then suggesting the site owner replace the broken link with a link to your own site. This can be lucrative because, due to the pace of change on the internet, there are plenty of opportunities at present to replace links to sites that no longer exist. 2. Choose to list only sites that look good — don’t waste any time on them if they seem low in content value, have excessive outbound links, or are too unrelated to your niche. 3. For each site on your list, test them for broken links. There is no need to go through every link manually; a Chrome extension called Check My Links is available for this purpose. 4. Make contact with prospects on the list. My advice is to kindly point out that you have discovered a broken link within their site and to offer your own content as a very suitable replacement. If all goes to plan, they will be very happy to do so, since you have presented them with a very simple and quick solution to their broken link. By submitting guest blog posts to relevant and high-quality sites, you can achieve three-fold success. Firstly, you gain several high quality links from authority sites. Secondly, you further your image as industry expert. And thirdly, targeted referral traffic heads your way from these blogs. It’s a more time-consuming tactic since you’ll have to seek out opportunities and then write some lengthy posts, but the benefits of featuring on some high-authority sites very much justifies the effort involved. 1. Find guest posting opportunities. Use search strings such as “keyword + write for us” or “keyword + guest article” to do so. AllTop.com is a fantastic resource for finding the best blogs in your industry (although bear in mind, many may not accept guest posts). 2. As writing a post can be very time-consuming, you need to make a very exacting list of the very best blogs to target (i.e., those that have a great following, suit your niche and are high-quality in terms of content and authority). 3. Find the perfect topic for each site by reading previously published content and gauging audience knowledge level. 4. Read the guest post requirements for each site. 5. Some sites can be very picky and you won’t get your post past the front door if you choose to ignore basic requirements about word counts, etc. 6. Submit your title and outline for a post if this is required by your target site. 7. Write your post, and remember that authority sites will only publish high-quality writing, so be rigorous in your standards of content and language. 8. Once your post is published, make the most of it by publishing on social media, interacting with comments on your post, and by making it known that you would love the opportunity to contribute further blog posts. Much like guest posting, providing interviews to popular and relevant sites not only provides some fantastic link opportunities, but also helps to grow your own profile as an industry expert. As well as interview articles on blog sites, you can benefit from taking part in podcasts, webinars and in expert advice round-up posts. 1. Interviews take many forms, and you need not choose all. Choose one type of interview at first that plays to your strengths and interests; if you are comfortable on camera you may choose to target webinars, or you may enjoy the process of writing and prefer the idea of blogs, or perhaps social media. You may choose to experiment with other forms farther down the line, but it’s best to stick to one for now. 2. Before getting involved, make sure your online persona is perfectly represented. Make sure your bio page tells your story adequately and that it is up to date, and includes links to your social media pages. 3. To find the best opportunities, closely follow other industry experts to see where they are being interviewed. You could also search for appropriate blogs using search strings like “keyword + interview.” Use social media to alert you to opportunities and requests for expert input. 4. When great opportunities present themselves, be proactive at nominating yourself. Keep this request polite and to-the-point, and include a link to your bio. 5. When the golden opportunity arrives to take part in an interview, remember to include appropriate and relevant links to your own site in any of your answers. 6. Once your interview is live, take time to comment on the host site and to engage with others doing the same, to share on social media and to further your connections with those that present themselves at this time since this may be of benefit later. This tactic involves using your industry’s most influential people to your advantage. By creating content that flatters them, they will almost certainly be happy to share and link to this content on your site. Best of all, it does not need to consume much of their time or yours at all. 1. When creating new content, quote a person of influence and link to their site. Make sure they know about it, and they will almost certainly be happy to reciprocate the link and share your content. 2. Consider reaching out and interviewing a notable person or persons in your industry on your site. It will only require a short list of questions and then copying and pasting their answers. Be certain to choose somebody who is active on social media and will willingly share your post. 3. For a greater volume of links, you should consider creating a roundup post of brief expert opinions or advice on a certain topic. Send out your request to multiple recipients then collate their advice into a roundup. Make sure all your contributors know when your content is published so that they can link and share themselves. Lastly, here’s a really simple tip to get quick and easy links from authority news sites. It involves very quickly helping a reporter out by providing a comment for their article. 1. Sign up to the HARO service. 2. You will now get three alerts daily with requests from reporters looking for information and opinions. 3. Search amongst these opportunities for requests relevant to you. 4. Respond by providing answers and information, along with a link to your bio. If or when your contribution is published, be sure to make the most of it with social media shares. James Reynolds is the founder of Veravo which consists of two search engine marketing agencies; SEO Sherpa and Click Jam. Reynolds is fanatical about all things search, social and content on the web. Visit his blog at SEOsherpa.com and talk to him on Twitter at @FollowJames. Reynolds, a contributor to several leading publications, mentors startup companies in his free time to positively contribute to the entrepreneurial ecosystem.